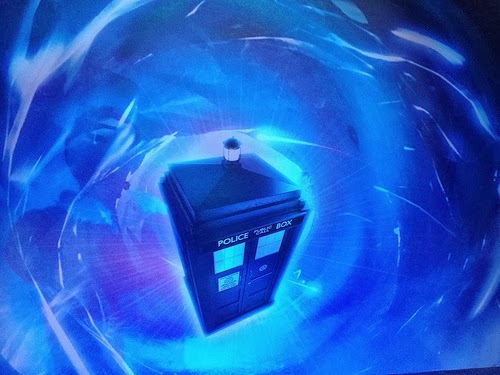 As a long time fan of Dr Who, I have been waiting for the special 50th Anniversary program, The Day of the Doctor & I have to say I was not disappointed at all! I won’t be giving any spoilers so if you haven’t seen it yet – don’t worry, you can keep reading! As a British kid of the 70’s, I grew up watching Dr Who – quite often from behind a cushion or the back of the sofa! Kids today seem so unimpressed with the Daleks & Cybermen but then they have so much technology bombarding them from all directions – what’s so scary about a tin can on wheels saying ‘Exterminate’ right? Especially when you have the X-men, all the Marvel Heroes or Transformers in your toybox! But let me take you back a bit (just in your head, I don’t have wibbly wobbly timey wimey powers unfortunately!) – imagine the Daleks in a time when Mankind was just reaching the surface of the Moon, when NASA & being an astronaut was every small boy’s dream? When there were only 3 TV channels & the service shutdown overnight or when computers were housed in huge rooms & run by specialists & the only access to Marvel Heroes or the X-Men was in a weekly paper comic – if you had enough pocket money to buy one of course! The world was a very different place in those days & so was the television programming – Dr Who was a Saturday teatime family viewing event and woe betide anyone who interrupted it! Well, I’m not sure that bit has changed much! The resurrection of the series in these recent years has seen the popularity grow enormously especially now that our American friends have discovered it & for many, the last 3 Doctors are all they know. The funniest thing about Dr Who for me though, is that it is possible to judge someone’s age from which Doctor is the one they remember best! I think that’s a very British thing though. So jumping forward to last night’s World Wide Premiere of the 50th Anniversary show – all I will say is Wow! I loved it, enjoyed it immensely, cried a fair bit and will no doubt be watching it again in the next day or two to catch the bits I missed! It did explain a few things, Clara is her usual mysterious girl self & seeing how they brought things together was very clever writing. I’m desperately searching for ways to explain without giving spoilers but it’s not going to happen! I’ll stop now but I will say that just in case you’re wondering – my Doctor from my childhood is Tom Baker (the one with the crazy long scarf). Once you’ve seen the show, you’ll perhaps understand why I just had to waffle on a bit here! ← Hearthstone Beta Key Giveaway – Getting This Party Started!